First it was Mummy Ooi. Now it’s Fat Her’s turn. This is what I’m giving him for Fat Her’s Day. 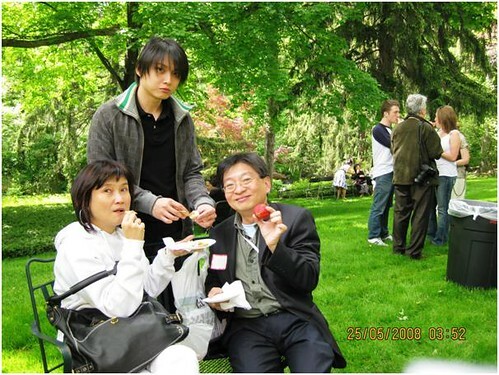 My mom is the World’s Most Awesome Mom and my dad is the World’s Most Awesome Dad so verily they belong together wtf. I think it’s safe to say that Fat Her is the most recognized father in the Malaysian blogosphere. Seriously he’s gone out and had people come up to him asking him if he’s Fat Her Ooi ok hahahaahha. A lot of my friends don’t really have very close relationships with their dads. The typical Asian dad has a stiff upper lip, may not talk much to his kids and shows his love by providing well for the family. Not Fat Her. Not the bit about providing for family la obviously!!! But Fat Her was the Fun Parent. Fat Her let me and Ooib hang bags on him and pretended he was a Christmas tree, prompting us to throw even more things on him to decorate. Fat Her was the one who, when Ooib and I drew comics all over his precious books and ruined them, he just laughed it off and kept them as memories. Fat Her was the one who, every time I got scolded by Mummy Ooi for forgetting something or doing something silly, got dragged into the scolding inadvertently, because she said he gave me the forgetful gene. Fat Her also gave me my height and my eyes. And he gave Ooib the Ooi nose, which will only enlarge with time WTF. And Fat Her gave me my name. He named me Audrey after Audrey Hepburn who is his all time favorite actress. Fat Her was the one we made jokes of, took funny photos of, and yet never ever got mad at us. Fat Her was the one who taught me to laugh at myself. That’s not to say Fat Her didn’t get angry. Sometimes we took advantage of him too much or went overboard doing something or other, and he’d explode. Then we’d run back to Mummy Ooi. 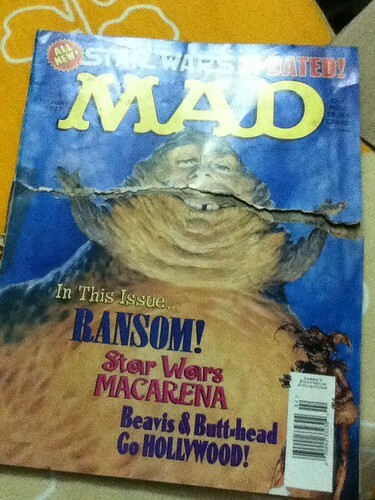 Like this Mad magazine I found a week ago while I was spring cleaning hahahaha. Fat Her took me and Ooib to buy magazines once, and being brats, neither of us wanted to hold the bag the magazines came in, even though they were OUR magazines. We walked and whined and quarreled and tried to palm the paper bag off each other until Fat Her finally lost his patience, turned around and tore this magazine into two HAHAHAHAHA. Then he walked off. Damn strong ok tell me which dad can tear a magazine in half in one try HAHAHAHAHAHA. Both of us finally got scared and picked up the torn magazine pieces and ran after him hahahahaha. I think when we got home we sat down together and taped the magazine back page by page so we could read it. Maybe Fat Her was being clever make us cooperate like this wtf. Fat Her was the one who, when it was time to apply for college, sat down with me and Ooib for months at a time each and helped us sift through colleges, prepare application essays, obtain teacher testimonials until we got into good schools. When I decided to major in Asian Studies he nudged me on when other parents would have balked or told me to do something useful. When I was thinking of writing an honors thesis, he excitedly helped me do research for it and bought books for me so I could have sources to refer to. 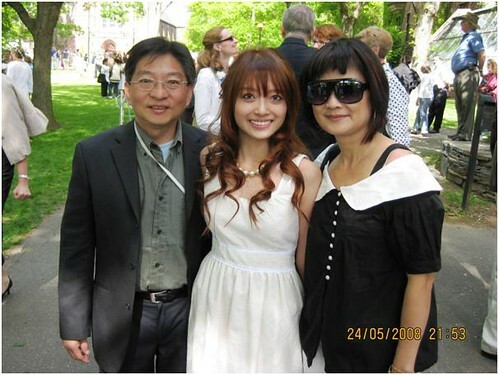 When Ooib was sitting for GMAT, Fat Her called him in Boston every night and coached him through the exam. When we graduated, Fat Her cried along with Mummy Ooi. Then he sat down with both of us individually and mapped out our interests and corresponding career options. Fat Her was the one with whom I had multiple fights over curfew growing up. Actually that’s the only thing we ever fight about – my safety. Until now he and Mummy Ooi are convinced I’ll be hacked to death by an axe murderer sometime if I’m driving out by myself. I think it’s because to him I will always be his little girl. Also because I really am little. Dunno what I’ll do if anything happens to Fat Her or Mummy Ooi. Kill myself wtf. 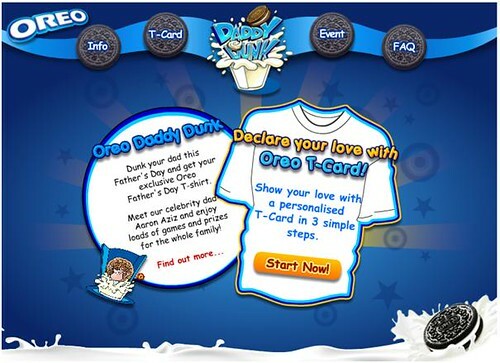 Just register with the Oreo Daddy Dunk app on Facebook to join the event. 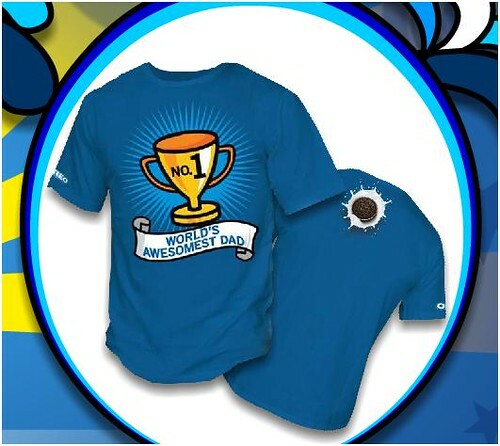 When you register, you can also pick a tshirt for your dad (mine is the one on top that says “Most Awesome Dad” and collect it at the event. 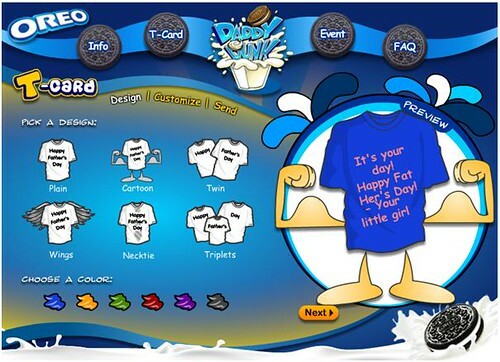 Happy Fat Her’s Day, Fat Her! Love, your little girl. You have a rly good father and you’re such a blessed girl 😀 I’ve always read stories that u wrote about Fat her and nvr commented though im always laughing at them. He’s rly cool. Continue to rock, Father Ooi! Happy Father’s day! throughout the entire blog post until the advertorial parts came in. the last picture and the last sentence are so damn sweet *TEARS*! my dad is the typical asian dad, sadly. i can’t recall much memories cuz he shielded all his hard work from me and my sisters so we don’t have to worry about his worries. u must’ve gotten his funny genes! In every post you either make me cry or laugh like a loon. This is a beautiful post about your dad. He’s a one in a million father, beautiful heart and soul. 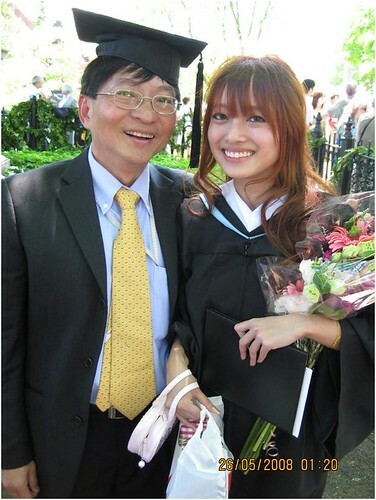 Happy Father’s Day papa Ooi. randomly went through this post and i cried reading your words.. made me think of my father and i miss him like crazy. you are such a great daughter that make your fat her feel proud of you.. i always make my father to worry about me, my studies, my future, my everything.. the main purpose i am still alive on earth is just to make him not feeling disappointed on me.